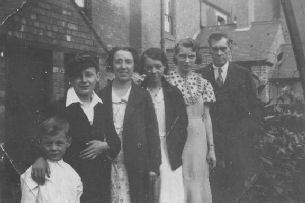 The Frost family, circa 1931. It was the industry of Coventry that brought Ethel’s parents together. Ellen’s father was a watch pinion maker and had moved his young family from Prescot, Lancashire in the 1860s to enjoy the employment opportunities of the Coventry watch industry. Ellen and Fred married on 31st May 1879 at St Michael’s parish church, Coventry. They had five known children, including Ethel. Their youngest son Leonard was a witness at the marriage of his little sister Ethel to Syd Frost in 1913 at St Mark’s, Coventry. Leonard later became a Lance Corporal in the Royal Warwickshire Regiment and was killed in France in 1916. Ethel went on to have four (possibly five) children with Sydney Percival Frost, the last son being named after her brother who perished in the First World War. Ethel and Syd lived in Cross Road, directly behind what was to become a munitions factory during World War II. Syd worked in the factory as did John, the eldest son. During the war Syd also took on Warden’s duties and 21 year old John (known as Jack) was a member of the Home Guard. Eldest children Ellen and Sue had married and moved out of home, so on many of the fearful nights that Coventry endured during 1940, Ethel was left at home with Leonard jnr who was aged 12 years. On the night of November 14th, young Len was ill, so Ethel decided not to go into an air raid shelter, sheltering instead with Len under the stairs of their home. Whatever Ethel’s decision had been on that night, the outcome may not have been any different. Their home took a direct hit from the German bombers who sought to obliterate the munitions factories and manufacturing industry of Coventry in a series of raids known as "Moonlight Sonata". Jack and Syd returned home that night to find their home razed and their loved ones gone. After the war, the home was never rebuilt. A park now stands between the neighbouring houses as a silent reminder of the destruction. Syd remained in Coventry dying a few years later. Daughter Sue left for Canada and Jack went to Australia. Jack returned home for a short time, and although he was very close to his older sister Ellen, his life was unsettled and he returned to Australia where he married and where he died in 2005. Ellen remained in Coventry all her life and passed away in January 2007, remaining in contact with all her distant siblings, nieces and nephews until the end. Today the grandchildren of Ethel and Syd maintain contact across the globe with a bond that across the globe is a silent tribute to the war time experiences of their parents and one which their grandmother Ethel would be proud of.